I am loving Matcha more and more recently. I love the energy that it gives me to fuel my day. . . . without all of the jitters of coffee. Plus, Matcha green tea powder can be used in so many recipes! I've recently been given the opportunity to try out a culinary Matcha green tea powder. Culinary Matcha is a different grade than the ceremonial grade Matcha green tea powders that are meant to be drunk as is. 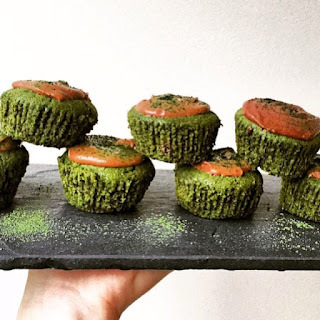 The Culinary grade Matcha powders are intended to be used in recipes such as smoothies, lattes, cupcakes, cookies and even savory dishes and meat dishes. 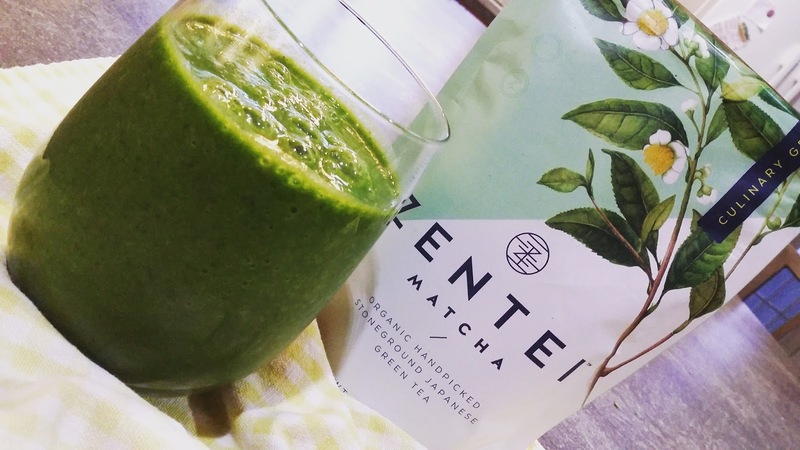 The culinary grade Matcha from Zentei is organic and is handpicked and stoneground into an ultra-fine powder. It is a wonderful bright green color. Matcha has up to 137 times the antioxidant EGCG than steeped green tea and provides sustained energy and mental focus. That's why I use Matcha on the days that I work! I need help getting energy and waking up in the morning, but I don't need the nervousness and jitters that coffee give me. I need steady hands to do my job. The Matcha powders have more antioxidants because the whole tea leaf is used and you consume the whole leaf instead of just steeping the leaves. There are so many recipes that you can use to reap the benefits of Matcha green tea. The Zentei website has a lot of great recipes including Matcha and Raspberry Bread (sounds yummy doesn't it??? ), Matcha guacamole, Matcha sesame shortbread cookies, Matcha and white chocolate popcorn (yes, please!!) and many, many more recipes. Don't these treats look awesome? 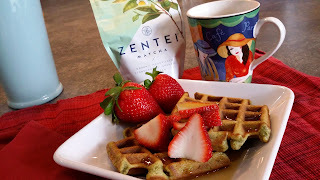 So far, I've used my Zentei Matcha green tea powder in a smoothie and homemade Matcha Banana waffles. They were both yummy. The powder worked wonderfully in both. It blended into both the waffle batter and the smoothie very well. There were no clumps, etc. The only issue I had with the Zentei Match green tea powder was the bag that it came in. I was unable to get the zip-top closed once I opened it. I ended up having to fold the bag over and put it into another container. I store it in the fridge. I did try it just as a tea to see what the difference is between the ceremonial grade Matcha and the culinary grade Matcha. The culinary grade is just not as "smooth" on it's own. Add a little milk to the culinary Matcha tea and it makes a world of difference. That's why it's great in lattes. The 100g bag contains 50 servings, so the bag should last a while! Yay to more energy and focus in all kinds of recipes! You can find Zentei Matcha at their website or at Amazon. Have you ever used Matcha green tea powder in a recipe?